[Updated] The Opening of the 2015 Legal Year was marked with a Special Court Sitting on Friday [Jan 23], with members of the Bar gathering to formally open the Legal Year. Speaking at the event, Chief Justice of Bermuda Ian Kawaley said: “Some might ask why so much care and expense is being deployed by the three branches of Government in relation to criminal trials when it is or ought to be obvious who is guilty and we should simply ‘lock them up and throw away the key’. “The answer is that the Judiciary together with its key stakeholders in this criminal justice endeavour or mission are sincerely committed to the constitutional imperative which holds that all citizens, be they pillars of the community or persons who appear to be committed to tearing down the pillars of the community, are equal before the law and entitled if charged with a serious criminal offence to a fair jury trial. “The good news is that when one reflects on the capacity of this Court 200 years ago compared with its current capacity to promote equal justice, this is an enduring battle which it is now easier with cautious confidence to imagine can be won. “It is difficult to imagine an ex-slave society anywhere else in the New World that has approached the project of equal criminal justice in the specific context of gang violence with greater respect for the legal rights and the humanity of citizens whom society has otherwise arguably failed. All concerned must not only be commended but enjoined to remember the sacred trust that has been reposed in them when inevitably confronted with trying situations in the months and years ahead,” added Justice Kawaley. Justin Williams, the President of the Bermuda Bar Association, also spoke at the Sitting, saying: “This time last year I noted the growing numbers within our ranks of both local and guest lawyers. The number of lawyers is still on the uptrend. “Bar Council currently oversees 448 active members and 70 law firms,” added Mr Williams. “The Bar has been supplemented by twenty-two new members having been admitted in 2014. “Of these calls, fourteen were Bermudian, two spouses of Bermudians and the remainder guest lawyers who had completed the 12 month residency requirement. “At 2013’s Opening, your Lordship noted that the size of the legal profession has almost tripled since October 1990. [to be accurate, 154 members in Oct 1990]. The trend appears to be continuing, with more members expected to join our ranks in the coming year. “I am pleased to be able to report that 2014 was infact a good year for the Bar. Financially we are in a better position than we have been for the last ten years. “We have new premises, meeting facilities for continuing legal education and have achieved, if not, significantly advanced, almost all of our projects and goals of last year,” added Mr Williams. The Special Sitting also some some lawyers walkout in protest over the re-appointment of Rory Field as DPP, and Chief Justice Ian Kawaley addressed this saying, “I have requested an urgent meeting with representatives of those members of the Criminal Defence Bar who left the courtroom as a group in the midst of Friday’s Special Sitting Ceremony. “I consider their conduct to have been inappropriate and I wish to afford them an opportunity to explain their actions, which were a distraction. The purpose of the Special Sitting was for the Judiciary and its main legal stakeholders to share with the public a review of the work of the courts over the last year and the commitments for the year ahead. Good afternoon one and all and welcome to this Special Sitting to commemorate the opening of the Legal Year to His Excellency the Governor, other distinguished guests and members of the nuclear and extended Legal Family. Special thanks are extended to the Bermuda National Museum for bringing the Admiralty Oar or Mace which was made for Bermuda’s courts as far back as 1697. This year a list of achievements over the last year and tasks to be achieved over the coming year appears in our Annual Report. I propose to use these oral remarks as an opportunity for reflecting more broadly on the health and general standing of the Judicial branch of Government. Almost exactly 200 years ago in early January 1815, the Chief Justice, lawyers and jurors attended the spanking new Sessions House building for the opening Assize of the new calendar and legal year. The Court was unable to sit, however, because the present courtroom had been co-opted, presumably by representatives of the Executive or Legislative branches of Government, for social events celebrating the completion of the new Sessions House. 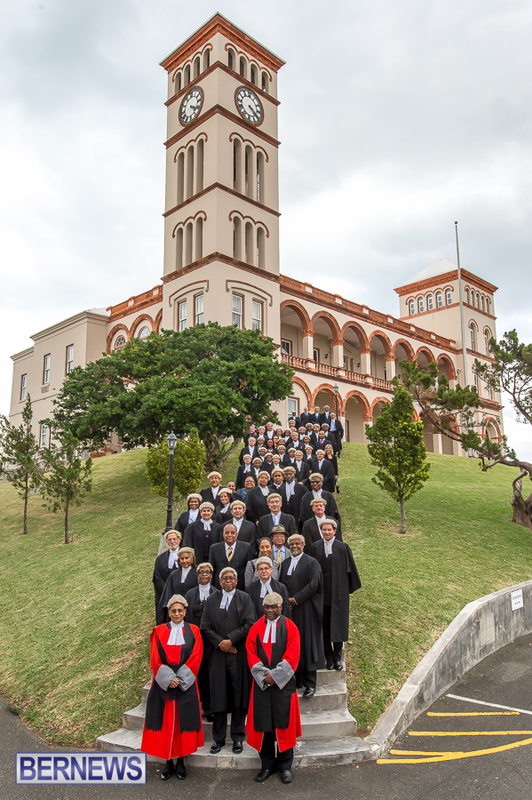 The battle by the Bermudian Judiciary for dedicated Court premises may symbolically be viewed as starting in 1815. And, while this particular battle is one which has yet to be won, it is perhaps instructive to take a broader view of the standing of the Judiciary today by taking a longer look back over the last two centuries. In January 1815, Bermuda’s Judiciary presided over a legal system which endorsed slavery and formally limited service in Parliament and on juries to property owning men. All men were equal before the law but some men were more equal than others. Of course, all free men were more equal than all free women. An important function of the Supreme Court was to uphold this legal and political order which deprived Bermudians of African or mixed African descent of their liberty not on proof of the commission of any criminal offence, but merely by virtue of their ancestry and status at birth. fundamental rights and freedoms were constitutionally guaranteed. The ability of the Judiciary to fulfil the historically revolutionary mission assigned to it by the 1968 Constitution has been subjected to a vigorous stress test by the gun violence which escalated in or about 2009. The former Government supported by the former Opposition and present Government supported by the current Opposition entrusted the Judiciary, working most closely with lay jurors but also with the DPP and the Defence Bar, the Police and the Corrections Department as well, to uphold the rule of law without diluting the constitutionally guaranteed fundamental rights and freedoms relating to criminal fair trial rights. This consensus was also vitally endorsed by the former and present Governor as well. It has combined high level policing, high level prosecuting, high level defending, high level adjudicating by criminal judges (most recently Justices Greaves and Simmons) together with lay jurors. Behind the scenes, it has involved high level attention to the needs of victims, the families of victims and vulnerable witnesses. Some might ask why so much care and expense is being deployed by the three branches of Government in relation to criminal trials when it is or ought to be obvious who is guilty and we should simply “lock them up and throw away the key”. The answer is that the Judiciary together with its key stakeholders in this criminal justice endeavour or mission are sincerely committed to the constitutional imperative which holds that all citizens, be they pillars of the community or persons who appear to be committed to tearing down the pillars of the community, are equal before the law and entitled if charged with a serious criminal offence to a fair jury trial. The good news is that when one reflects on the capacity of this Court 200 years ago compared with its current capacity to promote equal justice, this is an enduring battle which it is now easier with cautious confidence to imagine can be won. It is difficult to imagine an ex-slave society anywhere else in the New World that has approached the project of equal criminal justice in the specific context of gang violence with greater respect for the legal rights and the humanity of citizens whom society has otherwise arguably failed. All concerned must not only be commended but enjoined to remember the sacred trust that has been reposed in them when inevitably confronted with trying situations in the months and years ahead. The standards which have been set are worthy of emulation, but high performance standards (somewhat like fitness) are easier to lose than they are to attain and maintain. There is also a more perturbing truth which must also be spoken, and not drowned out by the plaudits we shower on the legal community’s predominant endeavour, offshore commercial law. Bermuda is not just a domicile near the top of the league table in GDP per capita and other positive social and economic measures. Bermuda is also near the top of the incarceration rate per capita league table as well. And, just as in 1815, a is proportionate percentage of the persons this Court is required to lawfully deprive of their liberty in the exercise of this Court’s criminal jurisdiction have the same ethnic profile. The integrity of the Judiciary’s ability to deliver impartial non-racial justice in a society still redefining itself against a racially divided past is compromised by this picture. In an interview published on January 3, 2015 in the Royal Gazette, the Premier was reported as calling for enhanced attempts to take pre-emptive steps to encourage at risk young people to find the right path. He stated: “We can all do better.” From the Judiciary’s perspective, what can we do better? There can be no simple pat answer to such an important yet multi-layered question. Clearly, our central mission of promoting and protecting equality before the law requires the criminal courts, working with our stakeholders, to convict and severely punish those who commit serious offences, particularly offences which deprive (or risk depriving) victims of their constitutionally protected right to life, but offences which inflict physical and psychological harm on victims as well. It also requires the Judiciary to campaign for appropriate administrative and institutional frameworks to buttress the independence of the courts and better equip us to effectively serve our diverse constituencies of court users. More broadly, our central mission also requires us to tackle important issues such as increasing efficiency in the criminal courts, increasing access to civil justice, promoting justice for families and adjudicating commercial disputes in a way which promotes confidence in Bermuda as an investment domicile. These matters will be touched upon by The Attorney-General, the DPP and the President of the Bermuda Bar Association. At a higher level still, however, the Judiciary and its stakeholders must also strive to find a way to promote the widest enjoyment of the constitutional freedoms which our forebears fought for and to consistently remind those who may find glamour in the role of criminal defendant that they are truly welcome to play other, more honourable, parts on the Bermudian legal stage. As we head slowly towards the faintly visible 200th anniversary of Emancipation in 2034, should we not aspire to inspire our sister New World jurisdictions not just with our legal wealth creation genius, but our creativity in using the law to promote greater liberty as well? May I express my deep appreciation to those who have spoken and all those present and unable to be here for the work that they have done over the last year and for the work which they will continue to do in the year ahead. Our annual report for 2014 should now be on the website under publications. I would like to thank my judicial colleagues Justices Norma Wade-Miller, Simmons, Greaves and Hellman for their stellar contributions throughout last year, assisted by Registrar Ms. Charlene Scott and Assistant Registrar Mr. Peter Miller. I am also indebted to all of the Administrative Staff of the Supreme Court, led by Manager Mrs Dee Nelson-Stovell for their invaluable contributions both last year and for making the 2014 Annual Report (published today) a reality. It has been traditionally said that the function of the Court is to simply interpret and apply the law, and that Judges and Magistrates should clinically and impassively decide on the cases that come before them. While that paradigm may have been justifiable in the past, and in many respects is still justifiable today, the Courts must also evolve and adopt a more humanistic approach to jurisprudence. I am pleased to say that the Magistrates have struck the right balance in applying and maintaining the Rule of Law and being responsive to the social plight of those who appear in the Magistrates’ Court. Historically, the Magistrates’ Court has been known as a “Court of Summary Jurisdiction”. However, in this contemporary societal and legislative framework the term “summary jurisdiction” is somewhat a misnomer, especially when one considers the increases in the Magistrates’ Court’s criminal, civil and family jurisdictions over the past few years. As a result, the complexity and the amount of the workload in the Magistrates’ Court has increased to such an extent that it is safe to say that the overwhelming majority of civil, criminal and family cases heard in all of the courts in Bermuda are disposed of in the Magistrates’ Court. The effect of this is that Magistrates come in close contact with literally thousands of people per year, litigants and otherwise. Further, the Magistrates’ Court is often the first and only contact that the Bermudian community has with the court system. So much so, that the Magistrates’ Court has been aptly described as the “Emergency or Engine Room of the Judicial System”. Magistrates routinely preside over very controversial and highly emotional hearings, often where ones’ freedom is at stake or where a child is removed from parental care. So while Magistrates are commonly referred to as “Creatures of Statute” our daily and “in-the-face” interaction with members of the public, many of whom have fallen prey to the economy and to the social ills of our community, has compelled us to creatively look beyond the pages of the Revised Laws of Bermuda in order to arrive at a decision which is just in all of the circumstances. Our Magistrates, by Orders of the Court, have found meaningful and sustainable ways: to encourage parties in civil actions to resolve their disputes without the need for a contentious and potentially expensive trial; to assist those overwhelmed by debt to satisfy their financial responsibilities in a manageable way over a reasonable period of time; to encourage delinquent parents to conduct themselves in a manner which is in the best interests of their children, both emotionally and financially; to provide guidance to the wayward teen who may have run fowl of the law; and, to give the drug addict a real chance at stopping their cycle drug use, offending behavior and incarceration. Often times we find ourselves being teachers, social workers, psychologists, surrogate fathers or mothers, and disciplinarians. It is therefore vitally necessary that, at times, strict legal processes and procedures should not slavishly follow the adversarial traditional trial court model. Further, we must often adopt innovative ways, within the proper legal framework of the law, to resolve deep seated and complex social issues. If we were to deal with matters in a solely clinical manner, i.e. strictly and solely as arbiters of fact and law, it will be truly myopic and it will not resolve the core issue which precipitated the dispute or the offending behaviour. To be clear, Magistrates’ often take the hard line and will incarcerate individuals when it is warranted to do so. However, we impose a period of imprisonment only after careful consideration of all other sanctions available in law, and only after having regard to all of the circumstances pertinent to the matter and to the individual. The creation of the Drug Treatment Court and the pilot Mental Health Court are clear examples of the Magistrates’ Court’s movement towards a more holistic and restorative approach to the criminal justice system. Since its inception in 2001 the Drug Treatment Court, instead of incarcerating offenders, has put them through intensive and extensive programmes which may involve drug counseling, life skills, anger management, employment skills, budgeting, etc. But as they say, the proof is in the pudding. We are happy to say that 90% of those who participate in the DTC do not use any illicit substances and do not commit any further offences while they are in DTC. Of those who have completed the DTC program, approximately 75% of them do not use illicit substances again and do not commit further offences. Although it is much younger that the Drug Treatment Court the Mental Health Court results are equally impressive. The vast majority of those who have passed through Mental Health Court have done so without committing further offences, but most important they have finally learned to manage their mental health issues and to positively function in society. It is unfortunate though that the Mental Health Court process is still being governed by the provisions of the Criminal Code Act 1907 and the Mental Health Act 1968. It is imperative that Mental Health Court be given legislative teeth which will provide the Court with far more expansive powers to deal with the unique individuals who participate in Mental Health Court. We are hopeful that this will take place in the early part of 2015. In respect of criminal matters Magistrates have admirably found the balance between rehabilitating the offender and administering justice for victims of crime. Through community based probation orders Magistrates comprehensively address the root cause of criminality which in turn goes a long way in stopping recidivism. While we appreciate that victims of crime can never really be compensated for the psychological and emotional impact which they suffer, through restitution orders Magistrates have sought to alleviate some of their pain. We feel though that our efforts should not stop within the precincts of the Court. It is our belief that Magistrates can play a vital role outside of the Courtroom by implementing Community Outreach Programmes. It is unfortunate that through budgetary constraints we were unable to conduct a Law Week in 2014, however it is intended that in 2015 we will make concerted efforts to not only educate the public about the operation of the Magistrates’ Court but to also take steps for the Magistrates’ Court to blend within the social and cultural fabric of the community. Therefore, in 2015 the Magistrates’ Court will: provide mentoring and shadowing opportunities for students who wish to pursue law or a position on the bench; institute “School to Court” programmes whereby students are invited to Magistrates’ Court sessions to witness for themselves how the Court operates; produce educational packets for members of the public to inform them about what to expect when they appear in Court and about the legal procedures of the Court; and, put on Court related art or writing exhibitions. It is hoped that through these Community Outreach Programmes that the community will better understand and respect the Court process. On another note, it is unfortunate that the status of the Magistrates are still that of the “poor relation” as was mentioned by the Learned Chief Justice in his address last year. There is still the need for Bermuda’s Constitution to be amended to bring Magistrates fully into the judicial fold and be given the same constitutional security of tenure that Court of Appeal and Supreme Court judges presently enjoy. I join the Learned Chief Justice in persuading His Excellency and the Honourable Attorney-General to take up this cause. For us as Magistrates, our independence and impartiality are sacrosanct and non-negotiable. Nothing in the media or in other places of authority will rattle our resolve to decide cases ‘without fear or favour, affection or ill-will’. But judicial independence does not mean that Magistrates’ should not collaborate with our key stakeholders. As I stated earlier, Magistrates come in contact with literally thousands of individuals per year who present with a myriad of social and financial issues. Many times we can predict the trends of criminality, of financial strife, of bad driving behavior, and of social or family dysfunction, well before other agencies do. I therefore urge other stakeholders to consider seeking the views of Magistrates’ before a final decision as to the formulation of law, policy or practice relating to the justice system. Having said this, I am encouraged by the genuine efforts of the Honourable Attorney-General in seeking our opinions as to some of his thoughts regarding legislation related to the Magistrates’ Court. In the absence of such collaboration or consultation we run the risk of statements being made about the Court process which are entirely devoid of factual evidence and/or are made without any adequate understanding of actually how the Magistrates’ Court operates. Indicative of the Magistrates’ Court’s genuine intent to assist other arms of Government is that on our own volition we have formed a Fees Reform Committee to review all of the current Court fees administered by the Magistrates’ Court, some of which are relatively low, in order to ascertain whether upward adjustments can or should be made by way of policy, practice, or legislation. Hopefully, this will in some way go towards addressing departmental budgetary constraints. Finally, I wish to take the opportunity to express my sincere gratitude to The Wor. Khamisi Tokunbo, The Wor. Tyrone Chin, The Wor. Nicole Stoneham, and The Wor. Archbald Warner. Each of them with aplomb, sensitivity, compassion, and firmness has adjudicated over countless delicate, complex, and difficult cases during their respective terms as Magistrates. I have the utmost confidence and assurance that they will continue in this vein in 2015.
on a day-to-day basis are in the trenches dealing with often times cantankerous, confused, and upset members of the public. It is they who often calm the nerves of those facing Court proceedings by explaining to them how the Court works. It is they who sooth or reassure victims of crime. It is they who deal with the arrogance and disrespectful conduct of some lawyers. It is they who keep the Magistrates’ docket and diary organized. It is they who keep the Magistrates in check and make them look good. For that I am eternally grateful. « Opinion: Is Democracy A Myth In A Colony?